CHICAGO – More than 70 of the world’s leading climate scientists, economists, and policymakers will convene in Chicago, May 16-18, to address the fourth International Conference on Climate Change. * Dr. Habibullo Abdussamatov, head of the Space Research Laboratory at the Pulkovo Observatory and head of the Russian component of the International Space Station. * Dr. Scott Denning, professor on the Atmospheric Science Faculty at Colorado State University and a proponent of the view that greenhouse gas emissions must be reduced to avoid harm to the planet. * Dr. Richard Lindzen, professor of meteorology at the Massachusetts Institute of Technology, whose work on the role clouds play in climate sensitivity and global temperatures has put him in the vanguard of global warming skeptics. * Dr. Ian Plimer, chairman of the Mining Geology Department at the University of Adelaide and author of more than 130 scientific papers and seven books dealing with climate change. * Dr. Willie Soon, an astrophysicist and a geoscientist at the Solar, Stellar and Planetary Sciences division of the Harvard-Smithsonian Center for Astrophysics. He is the receiving editor in the area of solar and stellar physics for the journal New Astronomy. His views strictly are his own. * Dr. Roy Spencer, principal research scientist at the University of Alabama at Huntsville, where he directs a variety of climate research projects, and author of the upcoming The Great Global Warming Blunder: How Mother Nature Fooled the World’s Top Climate Scientists. The conference is open to the public, and some 1,000 scientists, economists, business people, state and federal legislators and regulators, thought leaders, and media representatives are expected to attend at the Marriott Hotel on Michigan Avenue. The conference is the first major scientific meeting on climate since emails emerged last November from the Climatic Research Unit of East Anglia University in Britain. The messages revealed a deliberate campaign to suppress scientific data and debate over the causes and severity of climate change, sullying the credibility of the United Nations Intergovernmental Panel on Climate Change. Complimentary registration is available to qualified print, broadcast, and online journalists. For more information, contact Dan Miller or Tammy Nash at the Heartland Institute, dmiller@heartland.org or tnash@heartland.org. The Chicago-based Heartland Institute is a 26-year-old national nonprofit organization funded by 1,800 donors. No corporate donor provides more than 5 percent of Heartland’s $7 million annual budget. Germans citizens are rapidly losing faith in global warming following the Climate-gate scandals, according to a new report in Der Spiegel. The report indicates that just 42 percent of Germans are worried about global warming, down substantially from the 62 percent that expressed concern with the state of the environment in 2006. The media jumped on the story about a New York woman who supposedly crashed her runaway Prius into a rock wall. Yet another bogus Toyota story! Police investigators determined that she held down the accelerator pedal, did not hit the brakes, that the pedal returned to normal after she released it and that the car engine stopped when the stop button was activated. Clearly the media is in major support of Obama’s Government Motors and the UAW’s campaign to disparage Toyota to help their sales. And much to the chagrin of Obama and associates, is the fact that none of Toyota’s 36,000 employees in the US belong to the UAW. The media continues to avoid the bigger story asking why the Obama team have not published how they have processed the 30,000 auto complaints that owners have input to the NTSB during Obama’s first year in office. What cars are involved, what recalls have been done and what is the status of all 30,000? Roanoke Times, 3-20-10, Pg 10: 2 groups fume as Va disputes EPA proposal. No, that’s not the story! The story is that: Fourteen States are in Rebellion against the Obama administration; there were only eleven in Rebellion in the War Between The States and they were in rebellion for the same reason as today’s group. The Tenth Amendment (Amendment X) of the United States Constitution, which is part of the Bill of Rights, was ratified on December 15, 1791. The Tenth Amendment restates the Constitution's principle of federalism by providing that powers not granted to the national government nor prohibited to the states by the constitution of the United States are reserved to the states or the people. That Obama would have his EPA proceed with CO2 actions and also have Pelosi and Reid proceed with Cap&Tax legislation without a complete open and transparent review of the facts associated with our 250 years of natural global warming. Why let science get in the way of politics? Has Obama’s team not comprehended the ClimateGatePlus facts and the IPCC and other government’s reaction to those facts and the world-wide discrediting of the alarmist cabal and the universal call for a total in-depth review of the real facts? As chemists and engineers who are familiar with the science issues, and as current and past members of the American Chemical Society, we the undersigned urge the ACS Board of Directors to appoint a group of senior scientists, without vested interest, to revisit the science behind climate change in light of new scientific findings instead of relying on the report of the IPCC. Greenhouse gas emissions, such as water vapor, carbon dioxide, methane, and nitrous oxide, accompany human industrial and agricultural activity. While substantial concern has been expressed that emissions may cause significant climate change, measured or reconstructed temperature records indicate that 20th -21st century changes are neither exceptional nor persistent, and the historical and geological records show many periods warmer than today. In addition, there is an extensive scientific literature that examines beneficial effects of increased levels of carbon dioxide for both plants and animals. The American Chemical Society supports an objective scientific effort to understand the effects of all processes – natural and human -- on the Earth’s climate and the biosphere’s response to climatic processes. The Society promotes technological options for meeting environmental challenges, regardless of cause. We also are willing to accept a new statement that is based on the independent assessment being requested. Due diligence by the ACS Board of Directors on this issue is timely and important given the discovery of substantial scientific misconduct by senior practitioners of climate science and IPCC members, both in the UK and US which were uncovered in the past few weeks. Roanoke Times, 3-14-10, Pg 14: Study: Climate change stresses migratory birds; lots of birds are threatened by lots of things according to Obama’s EPA chief. An interesting plus for this article is that the author did not claim that our current warming period is man-made. What a refreshing change from most RT articles. The Climate is changing – The Climate has always been changing and that Darwin was big into change and extinction of species that can’t hack change. So much for the canary thing! The Roanoke Times has been soooo diligent covering the media and Democrat hype about the alleged Toyota “go-fast and can’t stop” issue including the now infamous California guy who at 93 MPH could get out his cell phone, call and talk to the 911 operator while keeping his Prius on the road. Amazing, because few folks can do that at 40 MPH with a small car. But now the Roanoke Times has fallen silent as they are prone to do with news that doesn’t suite their objectives. When the police car pulled up next to him and told him to “step on the brake” the car stopped. Of course the media front page story showed the police car in front of and touching the Prius as if the police car stopped the Prius. We all wondered why there was no visible damage to either car! Now we find out the driver has a history and status that raises serious questions about his creditability. And now the initial investigation by the NTSB indicates that the Prius brakes had not been applied for a long period of time like the driver alleged. And extensive testing of that car and like cars has failed to show this problem! Wow; one would think this would be worthy front page news for a newspaper as concerned with public safety awareness as the Roanoke Times! 1. It appears that some Toyotas have had gas pedals that stuck to the floor. 2. Investigations have shown that owner installed floor mats can and have caused similar problems in some cases. 3. There has not yet been published technical analysis showing cause-and-effect in the reported incidents and accidents. 4. Based on the big spike in complaints after the media blitz about the subject one is left to wonder about CopyCats like this one and a desire to get new vehicles through the lemon-laws and or law suites and or recognition. 5. Based on the fact that Toyota’s are the most numerous cars on the road and there are very limited numbers of alleged serious incidents; perhaps I am at greater risk of getting hit by lightning than the risk of driving my Camry. The Obama team has not published how they have processed the 30,000 auto complaints that owners have input to the NTSB during Obama’s first year in office. What cars are involved, what recalls have been done and what is the status of all 30,000? One would think that a newspaper, like the Roanoke Times, who are really interested in the public welfare and safety would certainly have used the FOIA by now to get and publish all this data. Quote by Washington State Democrat Rep Brian Baird: These bills are very long and very complicated because they are addendums and changes to very complicated system. And it’s not really a system. It’s a hodge-podge of (programs). Shouldn't the editors have read Pg 3 before writing their dull editorial on Pg 10? Scroll Down for a sample of how bad ObamaCare is. Apparently Democrat Rep. Baird understands that the very-minority Republicans have been bystanders and observers for the past year as Democrats fight over favors, vote-bribes, earmarks, pork-barrel programs and obscene self-gratification. it is NOT and never has been a method for government to enact major (2000 page legislation) for the takeover one sixth of our economy and one of our most personal life and death medical relationships. Are the folks up at the Roanoke Times insulting our intelligence on purpose –or – is it just turning out that way? Where is today’s number one Democrat ObamaCare Vote-getting story? The RT Editors seem to like steamy stuff and relish at sordid details about Republican transgressions. One would think they would really like the news that White House Chief of Staff Rahm Emanuel, stark naked, approaches you in the locker room to give you a piece of his mind for not supporting the president's budget and ObamaCare. This actually happened, according to Rep. Eric Massa, the embattled New York Democrat who resigned Monday and used his last hours in office to settle some scores with party leaders. It’s also amazing that the Editors of the RT haven’t given the lurid details of Democrat Massa’s encounter with a staff member that had homosexual overtones for which he’s allegedly being forced out of office. (Rhetorical Question: Why is Barney Frank still there?). The RT Editors devote hundreds of square feet of coverage to homosexual items and are major supporters for homosexuals they feel are harassed; just as Massa was; then why no RT righteous indignation over his case? And what’s the implication of Rahm Emanuel approaching other guys naked in the shower? Should we be reading something into that too? Perhaps yet another reason why the Army is reluctant to drop the “don’t ask, don’t tell” rule. So that the RT Editors may have some factual news items to work on; the following is a partial subset of detailed line-by-line issues that individuals and healthcare providers have about the ObamaCare Bill. It would be reasonable and prudent for the RT Editors to address these specifics items with their staff, employees, family members and with their own healthcare providers and then write a comprehensive news article explaining why they support ObamaCare. > all employers that self-insure!! > decides what treatments/benefits you get. > Page 29 lines 4-16 in the HC bill: YOUR HEALTH CARE IS RATIONED!!! > HC benefits for you. You have no choice! > citizens, illegal or otherwise. > families in unions & community organizations: (ACORN). > The Govt will ration your health care! > Americorps to sign up individuals for Govt HC plan. > Page 85 Line 7 HC Bill: Specifications of Benefit Levels for Plans. > "judicial review" against Govt monopoly. > The Govt will tell YOU what salary you can make. > doesn't provide public option will pay 2-6% tax on all payroll. > according to Govt will be taxed 2.5% of income. > of power driven wheelchairs. > patients - welcome to rationing! > Govt deems preventable (i.e...re-admissions). > admission that results in a re-admission -- the Govt will penalize you. > Page 425 Lines 22-25, 426 Lines 1-3: The Govt provides an "approved"
> frequently as a patient's health deteriorates. > Page 489 Sec 1308: The Govt will cover marriage and family therapy. I can well understand how Socialists and Communists love this bill; but how can even the most ardent Democrat support this destruction of medical free-enterprise and personal choice? A positive article about what many people and organizations and local governments are doing to conserve energy and reduce consumption of carbon-based fuels. It’s a nice touch to give folks positive visibility for doing good things. However, why do the editors of the Roanoke Times think they are bystanders or observers sitting in the bleachers watching this game? The RT has a massive carbon footprint that they refuse to address! – Why? This blog has been challenging the RT since Dec 2006 to step up to their responsibilities as community leaders and stewards of the environment. The RT’s carbon footprint starts in the planting and harvesting of pulp trees and the generation and delivery of electricity and other fuels and extends through delivery of the finished paper to my box in beautiful downtown Scruggs. There is a big energy savings involved in recycling the paper that they should be encouraging and supporting, tracking, reporting and demonstrating how they are improving over time. This blog has also been asking the RT to buy green-tags devoted to buying green energy from the Highland Wind Farm Project. No action there either! It’s way past time for the RT to stop being simply an observer of others good behaviors, realize that they are a big part of the problem and step-up to their Corporate Social Responsibilities to do the right thing! Roanoke Times, 9/24/08, Pg Va 4: A meeting sought ideas from guests to help the city reduce its carbon footprint. Going Green is a major component of moving toward sustainability. Roanoke leaders and employees should be commended for their efforts in these activities. A very puzzling item is: “where are the Roanoke Times Green efforts”? Roanoke Times, 6/2/08, Pg Va 6: Editorial: Give consumers a green power choice. Item #6. It’s also interesting that the RT Editors represent a large manufacturing organization that has a huge carbon-footprint that they refuse to acknowledge or document or quantify or improve. Roanoke Times, 3-5-10, Pg 3: Obama pushes reform effort; asked several House Democrats to take bold action on health care. Once again the Editors of the Roanoke Times embrace the Obama-Pelosi-Reid corrupt behaviors of pay-offs and bribes in order to pass ObamaCare. The editors showed no indignation last December over the Louisiana Purchase (Dem Sen Landau) and the Cream Corn Delight (Dem Sen Nelson) and the gross compromises with the AFL-CIO and UAW. These gross violations of the public trust caused public support for ObamaCare to tank to a low of only 1 out of 3 Americans who support this gross proposal. Now, yet again, the Editors refuse to include or cover in this so called “news” article the gross Obama malfeasance of nominating Scott Matheson for U.S. Circuit Court Judge. Scott is the brother of Congressman Jim Matheson who has been on the fence when it comes to supporting the President's health care reform proposal. Just more dirty Chicago politics that we can believe in and that the Editors of the Roanoke Times embrace with their slanted and biased coverage of the “news”. If ObamaCare is good for the American people, why does Obama-Pelosi-Reid and associates need to bribe members of Congress and the Senate to vote for it and why does the liberal media find the need to cover up the facts? Al Gore’s bloated physical condition pales in comparison to his mental water retention problem. After ClimateGate, GlacierGate, OzoneGate, BinLadenGate, AfricaGate, DutchGate, IndiaGate and the total capitulation of the so called scientists behind the IPCC-Gore-Hypothesis that the earth’s Armageddon is at hand and it’s man-kinds fault; Al continues on with his litany of lies. 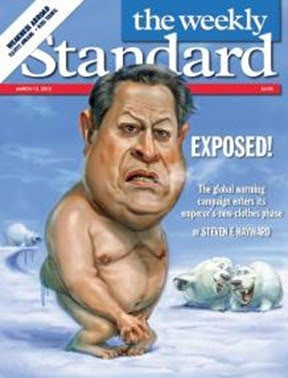 Al has compounded his creditability melt-down with his defense of global-warming hysteria in Sunday's 2-28-10 New York Times that: "The heavy snowfalls this month have been used as fodder for ridicule by those who argue that global warming is a myth, yet scientists have long pointed out that warmer global temperatures have been increasing the rate of evaporation from the oceans, putting significantly more moisture into the atmosphere -- thus causing heavier downfalls of both rain and snow in particular regions, including the Northeastern United States." ”According to "State of the Climate" from the National Oceanic and Atmospheric Administration, "Global precipitation in 2009 was near the 1961-1990 average." And there was certainly no pattern of increasing rain and snow on America's East Coast during the post-1976 years, when NOAA says the globe began to heat up. In fact, recent research actually contradicts Gore's claims about "significantly more water moisture in the atmosphere." The amazing aspect of the IPCC-Gore-Hypothesis-Alarmism is that the major liberal media continues to push and publish this tripe with unabashed abandon while ignoring and marginalizing the data that clearly shows we are in a 250 year NATURAL global warming period that started in 1750, the end of the little ice age. Roanoke Times, 3-1-10, Pg 3: Pelosi is ready to force (ObamaCare) bill through Congress. White House calls for an up or down vote. What a disturbing double-speak article hidden in fine print back on page 3. No mention of a filibuster or reconciliation or the nuclear option! No mention of the 60 votes required to cutoff a filibuster or the fact that reconciliation only applies to reallocating money in a funding bill! No mention of the American people’s views of this Pelosi-Reid-ObamaCare Bill. The current Obama-Pelosi-Reid attack on legislative due-process in defiance of the American people’s opposition to ObamaCare is the most dangerous political action in my lifetime. Was it not this type of arrogant and reckless disregard for the views of the American people that plunged the thirteen colonies into revolt against the King? Are we going to see another rerun of the Chicago Riots of 1968 or much worse? It’s way past time for the left-wing and liberal media to address and confront the reckless arrogance of the Obama-Pelosi-Reid trifecta from hell who clearly have decided that they are above and superior to the American people and are not their representatives. The US media, the so called 4th estate, are failing the American people through not only their omission of what is happening but far worse are acting as partners and enablers to this situation. As the media are so prone to say about others: Physicians heal thyself.